Top secret data has been stolen from the CIA, and the only man who knows its hiding place is dead. 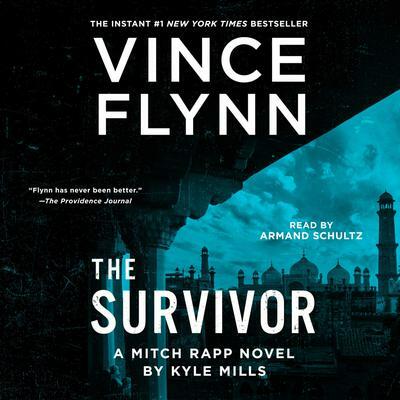 CIA operative Mitch Rapp must race to find the classified information in this blistering novel that picks up where The Last Man left off in Vince Flynn’s New York Times bestselling series. Joseph “Rick” Rickman, former boy wonder at the CIA, stole a massive amount of top secret and hugely compromising intel concerning classified operations all over the world, offering it (and himself) to the Pakistani secret forces. Only his plans went awry when CIA director Irene Kennedy sent Mitch Rapp to hunt him down. It turns out that killing Rickman didn’t solve anything—in fact, the nightmare is only intensifying. Rickman stored the potentially devastating data (CIA assets, operatives, agents) somewhere only he knew, and somehow, from beyond the grave, he still poses a mortal threat to America. Now it’s a deadly race as both the Pakistanis and the Americans search for Rickman’s accomplices and the information they are slowly leaking to the world. Will Rapp outrun and outthink his enemies, or will the Pakistanis find it first and hold America hostage to their dream of becoming the world’s new nuclear superpower?